The primary tools for measuring assets are the Attitudes and Behaviors (A&B) survey, and the Developmental Assets Profile (DAP). These surveys are used by schools, organizations, coalitions, and programs that seek to understand their young people’s lives through their strengths, supports, and resources. Search Institute periodically compiles the results to create snapshots of Developmental Assets among young people in the United States. Although these samples are not nationally representative, they provide insights into young people’s strengths and challenges through the lens of Developmental Assets. The most recent aggregate assets data comes from students surveyed with the Attitudes and Behaviors survey, between 2012 and 2015. A total of 121,157 students in grades 6 to 12 were surveyed. Of these, 60,973 were female and 57,873 were male. 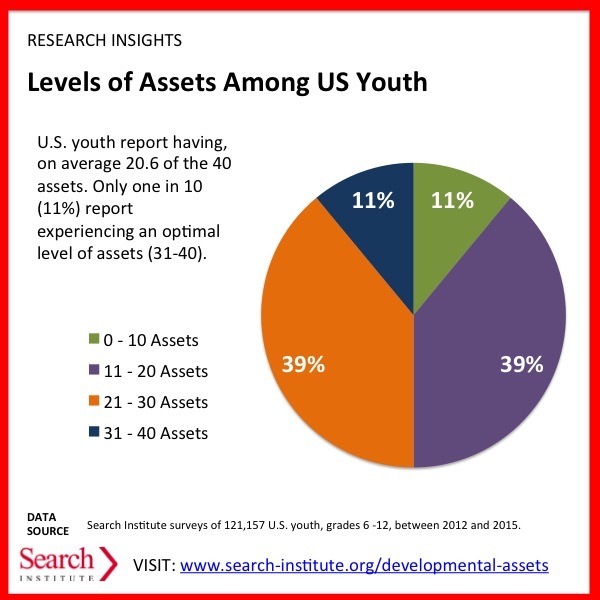 Experiences of Developmental Assets: On average, these young people experienced 20.6 of the 40 assets. Only 11% experience high levels of assets (31-40 assets). An equal number (11%) experience 0-10 assets. Gender: Females report higher average levels of assets (21.3) than males (19.9). 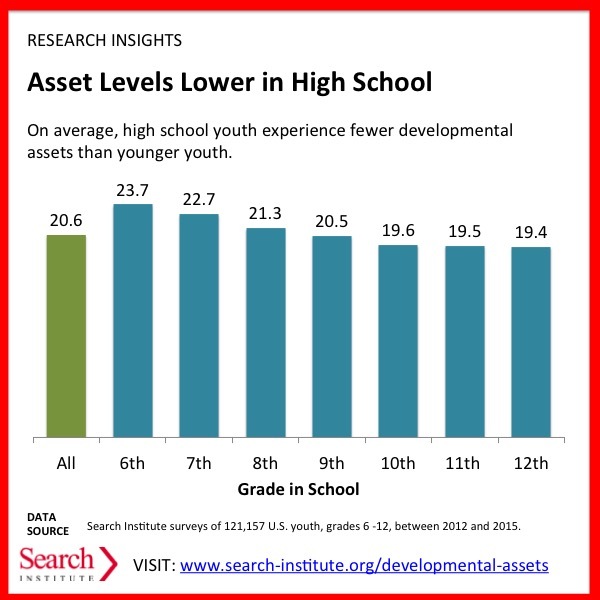 Grade level: High school youth report lower levels of assets than middle school youth (chart). On one level, the 40 Developmental Assets represent common wisdom about the kinds of positive supports and strengths young people need. But extensive research reveals that assets can have a powerful influence on adolescent behavior. Reducing Risks—the Protective Power of Assets: In addition to measuring Developmental Assets, the Attitudes and Behaviors survey also measures levels of high-risk behaviors, including the use of tobacco, alcohol, other drugs, violence, and early sexual involvement. 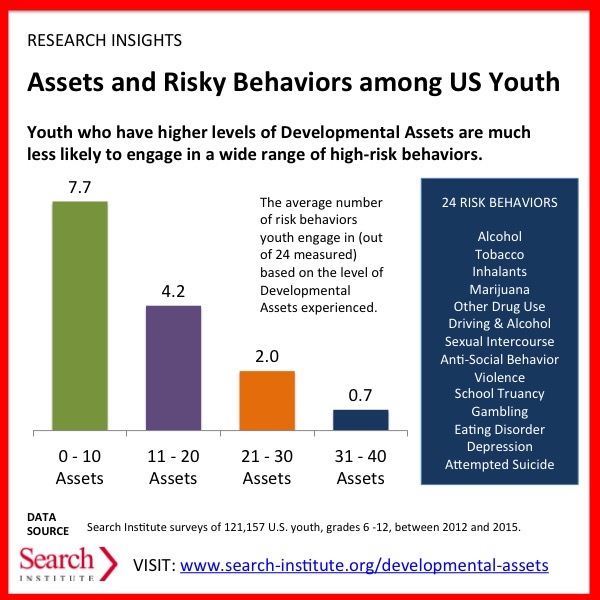 Youth with low asset levels (0-10 assets) engage, on average, in 7.7 of 24 risk behaviors, compared to 0.7 risk behaviors among youth who experience 31-40 assets. Promoting Thriving: The survey also measures young people’s engagement in a wide range of thriving attitudes and behaviors, including succeeding in school, valuing diversity, helping others, and overcoming adversity. Youth with 0-10 assets engage in 2.7 of the 8 thriving indicators measured, compared to 6.1 thriving indicators among those experiencing 31-40 assets. Assets Matter for Young People from Diverse Backgrounds: It’s important to note that assets matter for young people from all backgrounds. Regardless of gender, ethnic or cultural heritage, economic situation, sexual orientation, or geographic location, these assets both promote positive behaviors and attitudes and help protect young people from many different problem behaviors. The asset framework points to a wide range of potential starting points for intentional efforts to strengthen the developmental foundation for young people, and Search Institute has created a wide range of tools and resources to stimulate asset-building efforts in schools, families, organizations, and communities. 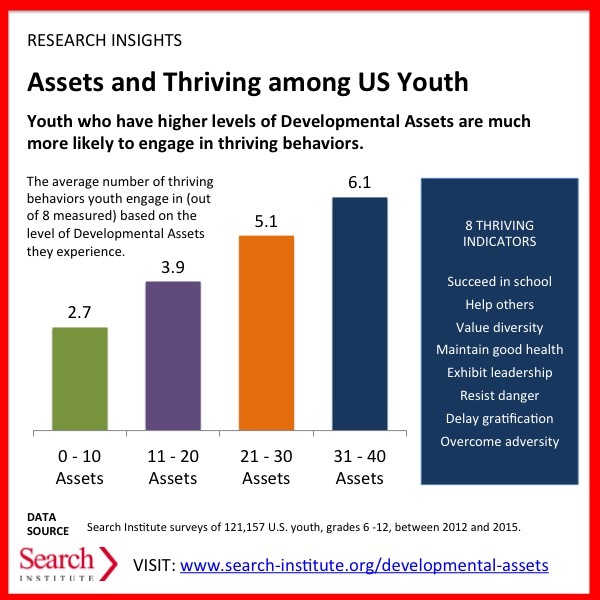 Research by Search Institute and others shows that Developmental Assets play a critical role in development for young people from all backgrounds and situations. Yet we also know that all young people do not experience assets in the same ways, and that assets may play different roles in their lives based on their culture, context, and experience. Search Institute’s surveys of 121,157 U.S. students in grades 6 to 12 shows both similarities and differences in asset profiles based on young people’s self-reported race-ethnicity. 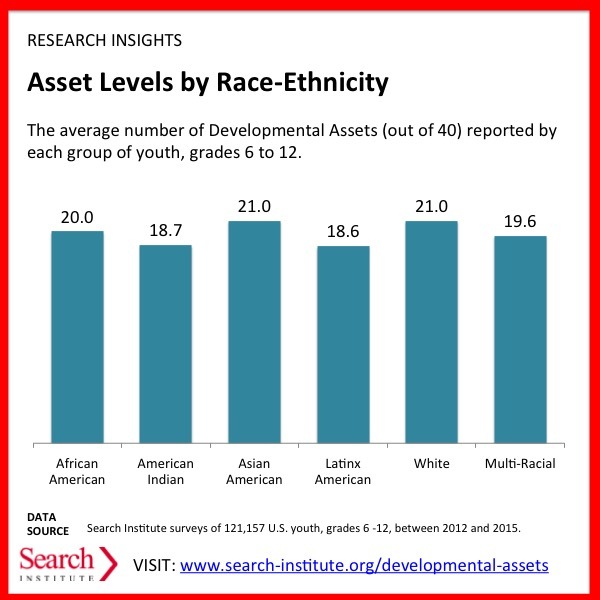 Levels of Assets: The number of assets young people experience varies somewhat by race-ethnicity (see chart), ranging from 18.7 among American Indian youth 21.0 among both Asian American and white youth. Although there are some overall differences, the underlying story is that young people from all racial and ethnic groups have quite similar levels of strengths and gaps in Developmental Assets. These differences may reflect, in part, different cultural experiences and strengths. They also point to ways schools, communities, and society provide the kinds of opportunities and supports young people need within and across different cultures and contexts. Providing focused supports, relationships, and experiences may be particularly important for specific groups of young people based on their experiences of Developmental Assets. As important as the experiences are, across the differences, all young people experience key strengths. At the same time, no group of young people, on average, is growing up with a robust base of supports and strengths that help them be resilient and thrive as they grow up. Since 2012, Search Institute has asked young people to report their sexual orientation and gender identity on its survey, Attitudes & Behaviors, The inclusion of these items offers the first available data on the Developmental Assets of LGBT youth. Between 2012 and 2015, 12,262 lesbian, gay, bisexual, and transgender (LGBT) youth participated in the survey. A NOTE ABOUT THIS RESEARCH: Although each of the subgroups of young people within the LGBT community have different life experiences, we present aggregate data of LGBT youth and, in many cases, data for the broader categories of lesbian/gay, bisexual, and transgender youth. This high-level disaggregation highlights the need for deeper examination of more fine-grained explorations, including intersectionality issues of sexual orientation, gender identity, race/ethnicity, socioeconomic status, and other individual differences. Some of these issues are being examined in ongoing analyses of this dataset. 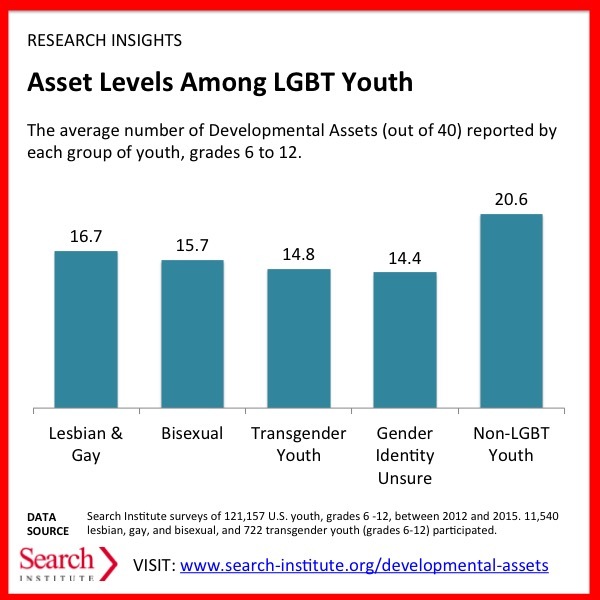 Level of assets—Lesbian and gay youth in this sample report an average of 16.7 assets out of 40. Bisexual youth report an average of 15.7 assets, transgender youth report an average of 14.8 assets. 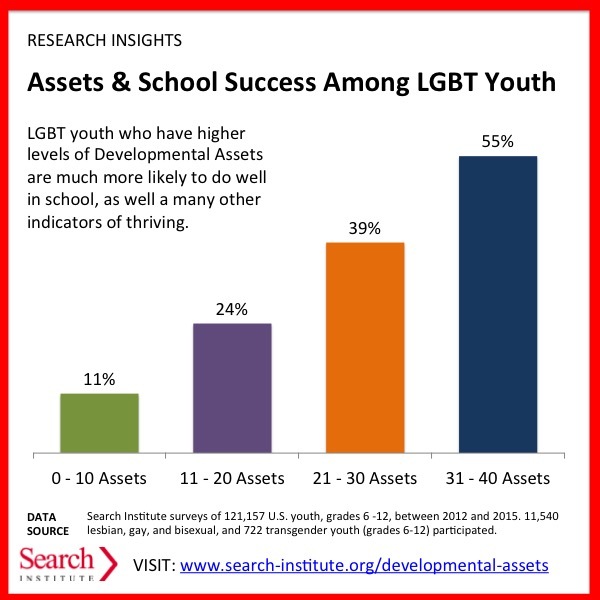 Non-LGBT youth report an average of 20.8 assets. Challenges— About one in four LGBT youth experience several assets, including a caring neighborhood (24-28%, for different subgroups of youth: lesbian/gay, bisexual, and transgender), parent involvement in schooling (21-22%), positive family communication (19-21%), adult role models (16-21%), youth as resources (16-19%) and community values youth (12%). Family support (55% among LGB youth and 49% among transgender youth compared to 75% among non-LGBT youth). These findings echo the well-documented risks and challenges faced by LGBT youth. In addition, these findings highlight that LGBT youth do not experience the levels of supports and opportunities that, on average, non-LGBT youth experience. In addition, many LGBT youth experience major changes that occur in their relationships and their own sense of themselves when they come out. These times of transition represent important opportunities for reinforcing or rebuilding positive supports and opportunities. Creative activities (27% of LGB youth and 29% among transgender youth, compared to 19% among non-LGBT youth). Prevention—Like their peers, LGBT youth who have more assets are much less likely to engage in a wide range of high-risk behaviors. For example, 56% of LGBT youth who report 0-10 assets report having attempted suicide, compared to 11% of those who report having 31-40 assets. Promotion—LGBT youth who have more assets are much more likely to engage in thriving behavior. 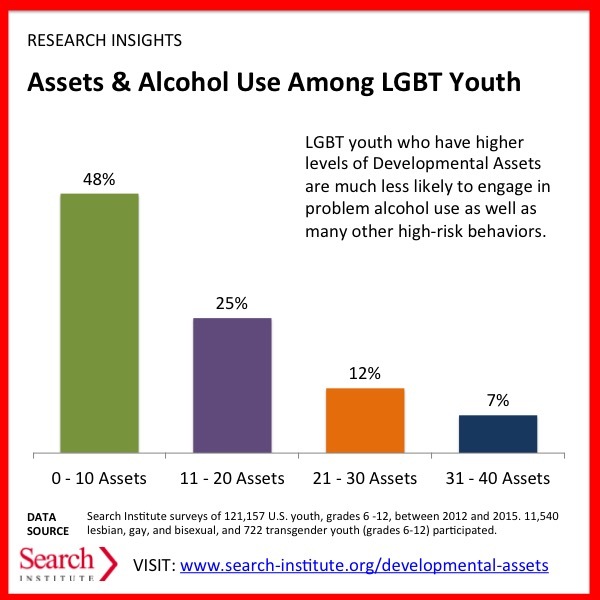 For example, 20% of LGBT youth who report 0-10 assets maintaining good health behaviors (e.g., exercise, diet), compared to 83% of those who report having 31-40 assets. Assets are strengthened through relationships and supports from families, peers, teachers, program leaders, and other adults in young people’s lives. LGBT youth experience fewer of these supports and relationships—many of which may have been stressed or even disrupted when these youth identified as LGBT. In many communities, LGBT youth face ongoing stigma and discrimination, which further undermine their experiences of Developmental Assets as well as other elements of well-being. Recognizing the gap in assets for LGBT youth opens opportunities to form strong developmental relationships with these young people, getting to know them for who they are and who they are becoming. It also calls on schools, organizations, and communities to provide the kinds of opportunities, role models, and supports that LGBT youth need to learn, grow, and thrive. At the same time, many LGBT youth experience strong foundations of assets, and they grow up thriving, even in the midst of challenges. Noticing and celebrating these strengths has potential to reframe biases and assumptions that focus only on risks. It recognizes resilience in the face of challenges and strengths to live with purpose, promise, and possibilities. Related research: Search Institute is currently conducting in-depth data analysis of the assets of LGBT youth, particularly focusing on the role of assets in suicide prevention among LGBT youth. Many schools, organizations, and coalitions use the briefer youth assets survey, the Developmental Assets Profile (DAP). Instead of measuring each of the 40 assets, the DAP measures the eight categories of internal and external assets. It also examines five contexts in which young people experience assets: personal, interpersonal, family, school, and community. On average, youth show the greatest strength in the asset categories of Boundaries & Expectations (22.7 on a scale of 1-30), Support (22.6), and Empowerment (22.1). The greatest gaps are related to Constructive Use of Time (19.0) and Positive Identity (20.3). DAP respondents report the greatest strength in assets in their families, with the greatest gaps in their community. (See chart.) Family is the source of greatest asset strength for youth from all racial-ethnic groups, and community is the greatest gap in assets across all racial-ethnic groups. NOTE: Because the measures are different, the results of the Developmental Assets Profile (DAP) cannot be directly compared to results from the Attitudes & Behaviors Survey. (For example, scores on the DAP are typically slightly higher than might be expected when compared to results from the Attitudes & Behavior Survey.) The underlying patterns and associations are consistent between the two surveys, allowing users to select the survey that best fits their goals and their constraints. Consistency: Despite this great diversity across cultures and samples, young people tend to experience just a barely adequate level of the Developmental Assets that have repeatedly been shown to be associated with and contributing to well-being. Strength in families and schools: Family and school tend to be bulwarks of positive influence, especially in terms of providing youth with rules and expectations for behavior. Less strength in the community: Global youth tend to describe their communities and villages as the places where they are least likely to experience these critical developmental relationships and opportunities. Commitment to learning: Most young people also report having a solid internal commitment to learning, including such assets as having achievement motivation, feeling engaged in learning, and liking reading. Those positive educational experiences and attitudes about learning are especially critical for youth in the developing world, for whom, especially among girls and young women, education is the single best vehicle for raising their odds of having a satisfying and productive life. 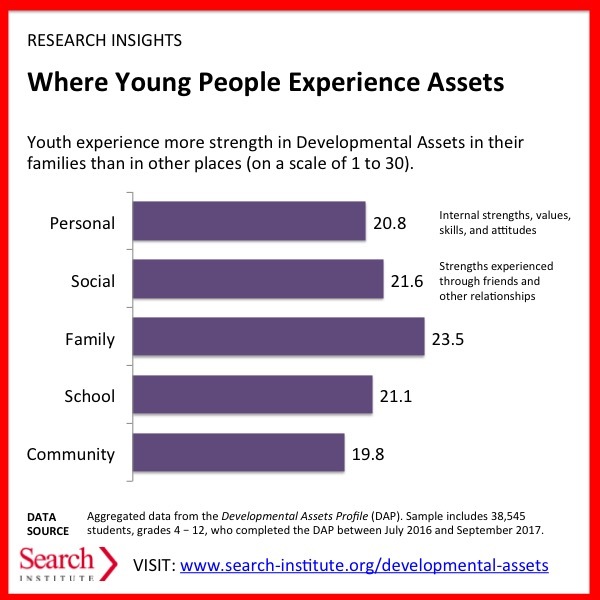 Assets link to positive outcomes: Young people are better off when they experience higher levels of these Developmental Assets in every setting where we have been able to associate DAP scores with other measures of well-being. These include mental and physical health, education, civic engagement, and workforce readiness, even in the most challenging environments. These results provide evidence that the Developmental Assets Profile has been shown to be, with appropriate contextualization and testing, psychometrically and culturally acceptable for one-time descriptions of the condition of young people in a wide range of countries. It can also be used in program evaluations to track change over time. Search Institute’s international research is conducted in partnership with international organizations that have relationships and work with the young people, programs, and communities where the research is conducted. Major partners have included Save the Children, World Vision International, Education Development Center (EDC), Georgetown University, and TechnoServe. Related research: See Search Institute’s assets research with Save the Children’s livelihoods project, Youth in Action, in five African countries. View reports and articles from our international assets research.